Based on real life behind-the-scenes Hollywood, fictional actress Liana Marie struggles with trust and commitment as she shapes the role she plays in her own life. 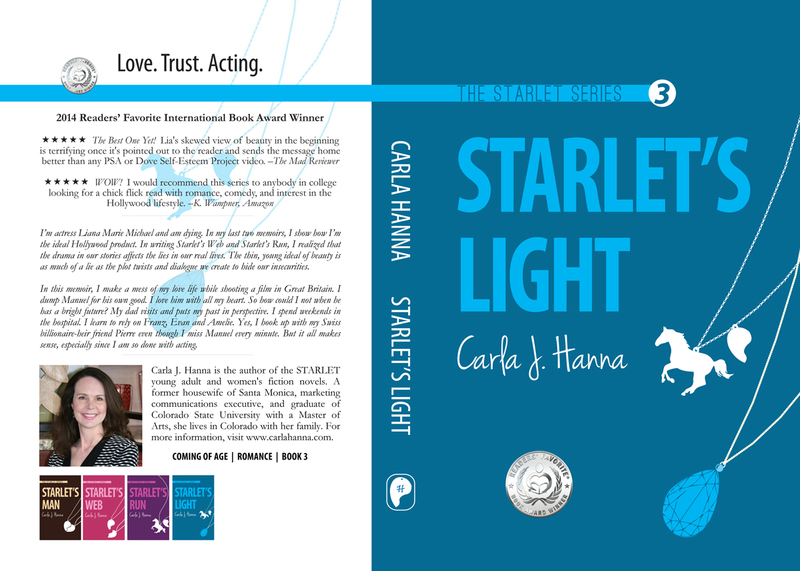 She gives up the fight for authenticity until she sees the way she can shape her future in award-winning Starlet’s Light, the third fictional memoir in the Starlet Series for new adult & college readers. Love. Trust. Acting. Teen Hollywood GETS CONFUSED. Liana Marie works on set in Europe. Now struggling with Congestive Heart Failure from her beauty cocktail, she dumps Manny and hooks up with Swiss pharmaceutical billionaire-heir Pierre. She learns about what she wants and commitment is number one on her list. With the support of new friends and old ones, she decides to risk social media annihilation. She wants Manny. Does he feel the same? Chris the four books in the Starlet series have reached best seller status on Amazon. If I am not mistaken this is the fifth or sixth week and they are still top of the pops! I am ecstatic! Thank you, Bridgitte! What a great success: Starlet’s Light has stayed on the Amazon best seller list since January 2, 2015.